Born in St.Ives, John started his career at Cambridge United, making his debut in May 2004 in their final game of the season. He became their first choice keeper the following season, which included a short trial with Manchester United. In November 2004. His performances attracted Premiership clubs, and it was Everton who paid a £250,000 transfer fee for his services in June 2005. He made an appearance for the England U19 team, but he was limited to just a single appearance for Everton, being the third choice keeper behind Tim Howard and Iain Turner. 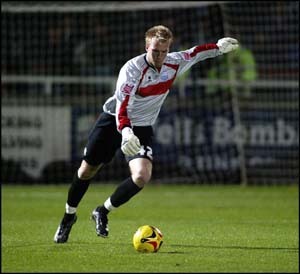 He went on loan to Walsall in September 2005, before signing for Diamonds on a one month loan deal 9 November 2005. He was however recalled by Everton just prior to end of his loan period. He went on to spend further loan periods with Chester City, Stockport County, Wrexham, Bristol City and Stockport over the following two years. Although he remained an Everton player, he went on loan to Crewe Alexandra from 29 January 2009 until the end of that season, and then on a six-month loan to Motherwell prior to the start of the 2009/10 season. On 5 July 2010, he signed a three year deal with Championship side Norwich City for an undisclosed transfer fee. On 15 August 2012, John made his first full International appearance for England, when he came on for the second half against Italy. He stayed with the Canaries until the end of the 2016-17 season. He moved to Wolverhampton Wanderers in the summer of 2017, helping the club gain promotion to the Premier League at the end of that season. His Wikipedia page is here.